Leche Asada, or Peruvian baked milk pudding, is very similar to flan and if you’ve made the Crema Volteada con Quinua, this recipe is even simpler. The main difference is that it has no caramel and is made with whole milk instead of condensed milk. But the result is a sweet and creamy comfort food that is over a century old. I started with the base recipe in Sandra Plevisani’s award winning book El Gran Libro del Postre Peruano (The Great Book of Peruvian Desserts) but inspired by one of her historical notes, I decided to add bread. According to a cookbook from 1867, Leche Asada had bread as a thickener, so I used some of my favorite bread — Challah. Though the preparation was pretty quick, it required some patience to slow bake the dessert in a bain-marie. And once they were done, I put a few of the ramekins under the broiler for added color and texture. Somehow, I was able to take a few pictures before devouring three servings of comfort, Peruvian style. In addition to the ingredients above, you’ll need a pot to boil the milk, 2 bowls, an immersion blender, 12 ramekins, and a deep pan for a bain-marie or hot water bath. Boil milk and sugar in a pot over medium to high heat. After boiling, transfer milk to a bowl and let cool. In a separate bowl, beat eggs and yolks. Add the eggs, essence of vanilla, and bread to the milk. Use an immersion blender to purée the bread. Pour the blended mixture into ramekins, and place ramekins in a bain-marie. Bake in oven until cooked through, between 1 and 1 1/2 hours. Remove ramekins from oven and bath, serve warm or at room temperature. 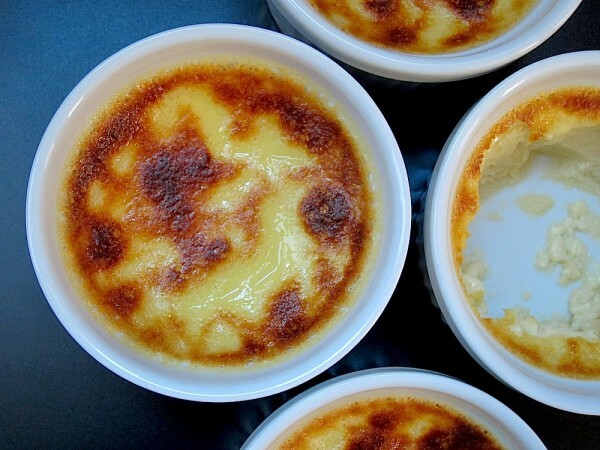 Optionally, place individual ramekins under a broiler before serving to brown the top of the dessert. 12 servings, 4 oz. each. The pieces of Challah bread measured about 2 cups, loosely packed. To cool the boiled milk before adding the eggs, I placed the bowl of milk in the fridge for about 1/2 hour. Baking time depends on your oven, the size of the ramekins and the size of the bain-marie. I used 12 ramekins of 4 oz. each, placed in a 13″ x 19″ cake pan filled with water to half the height of the ramekins, and it took 1 1/2 hours to cook through. Be extra careful removing the hot water bath from the oven. Also, depending on your broiler it may take less than a minute to brown the top of the dessert. If you don’t finish the dessert, store in the refrigerator in an airtight container or wrapped individually.